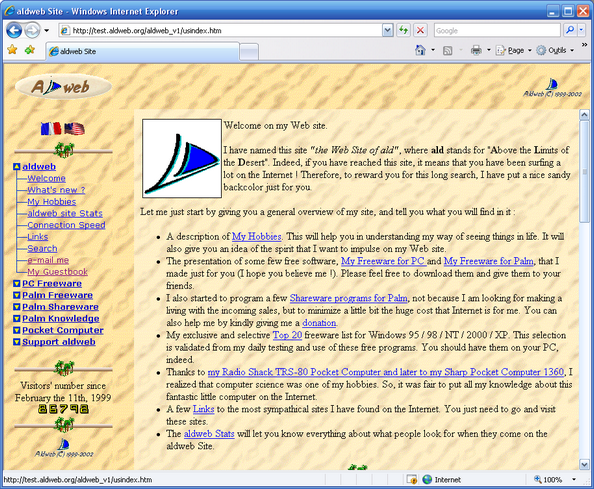 The aldweb was put online on the internet February 11th, 1999. 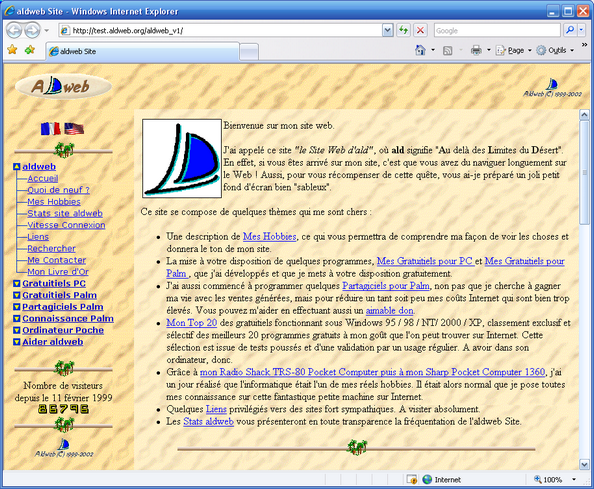 It was initially made of 4 HTML pages, or 8 to be precise when taking into account the English mirror of the French version, written with my Ma Page Web freeware. 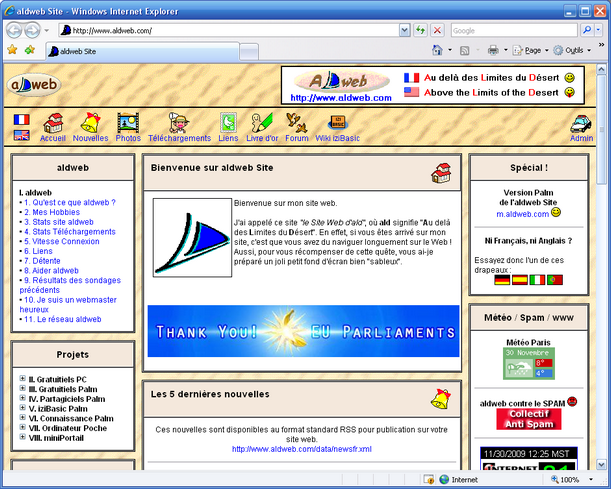 It included the home page, the My Hobbies page, the presentation of my two first freeware programs Ma Page Web and Gestion de Projet. It will evolve this way, being enriched by a a new PC freeware (Mémo Friends), some articles about my hobby for pocket computers of the 80's, my first Palm freeware and Palm shareware. The version 2 story started in June 2002 when I was bored to maintain the static HTML pages which had become too many over time. 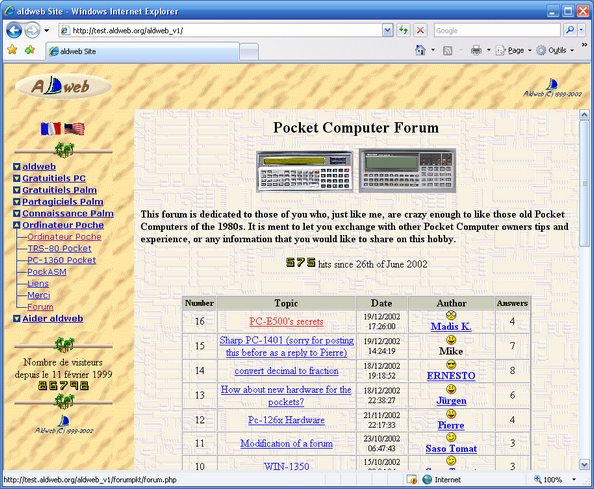 So, I started looking for a dynamic web portal system. Fall 2002, I came to the conclusion that none of the open source systems from that time would cover my needs, being a simple portal, natively bilingual, without a sophisticated database system. Therefore, and because I like the sentence which says (in French) that nobody is better helped but by himself, and also because I was curious to learn the new trends and what dynamic web programming was, I decided to code a little portal system for myself and for the purpose of my web site needs, which I named miniPortail (tinyPortal in English), and I put the new version of my site online January 1st, 2003. I then told myself that maybe some of my visitors could be interested by this system and I decided to offer the script files for free and open-sourced them. Without knowing it, I had just launched the GuppY project, and I was for long to spend much more time in developping this tool than any of the other areas of interest which I initially developped my site for, and this was just the opposite to the main objective for easing my work with such a portal system! Indeed, right after it was put online, miniPortail met an incredible success, which I was really not expecting at all, and pionners joined me as they found what they were looking for in this web portal system: something very easy to get hands on and to use, a robust reliability thanks to its centralized engine of the different components a portal system is made of. The story keeps going on very fast, new versions are put online very quickly as new good evolution ideas arrive all the time, and a second developper quickly joins me. The GuppY Team is created, a wonderful user manual is also written, helping even more first time users to use the tool. Soon, miniPortail is not a tiny system anymore, it is therefore relabelled to its current name being GuppY in September 2003 and it leaves my personal web site to its www.freeguppy.org dedicated web site. I carried the project with a lot of fun, but also with too much dedication given my available free time, until fall 2004. Two years after having started almost in spite of my own desire this project, I decided to give it a break. 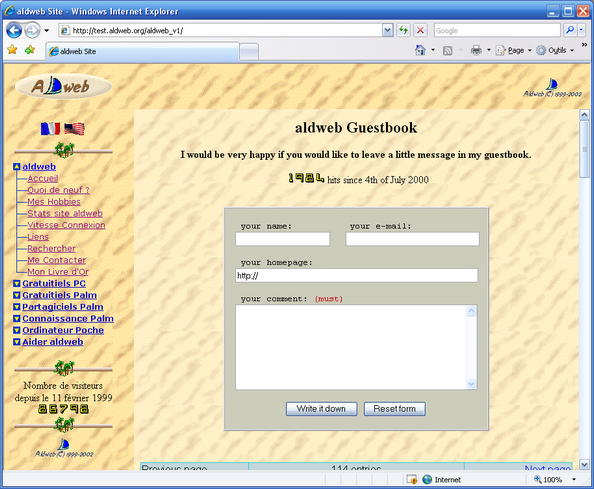 My own personal web site was then to remain frozen on the latest version 3.0 of GuppY which was the last version I had leaded, I was to go back during 5 years to my Palm programming hobby and my Palm software were a great success too. During the last 4 years, the new talented developpers who took over the GuppY project kept enhancing this web portal system. The GuppY Team, on its side, animated the project in a wonderful way, up to creating a dedicated non-profit organization. My site was 10 years old on February 11th, 2009 without nobody noticing it, and it had to wait for me until end of November 2009 before I took the time to finally upgrade it to the latest GuppY version 4.6.